Daddy darling struck gold with this find. Plucked from a market stall at Salamanca Dad found this vintage record album. Right up my alley. Now just have to find a record player. Dug out of a box was this - a board game from the 60s called Squatter. Invented by Robert Lloyd and now in it's tenth edition (apparently, though I've never seen it anywhere...ever...). It's kinda like a monpoloy, except you have a sheep station and you need to upgrade your paddocks. Fro, the website: "Squatter is a board game about Australian sheep farming, for 2 to 6 players. Squatter is a simulation game based on real life farming and is a mix of luck and strategy. Farmers face many disasters such as drought, bushfire and floods. Nevertheless, prudent farmers develop a good strategy to protect their farming business and take such precautions as providing adequate fire fighting equipment and sufficient hay." I love it. And sorry, Shippy, but it's mine now. But I'll look after it. Come over and play any time. From the same fab market stall at Salamanca i found this great Tupperware cake transporter. Wonderful. As my friend, Lou, said 'we all get very excited about storage now'. Oh, yes, indeedy. And lastly, my little blue Wren. 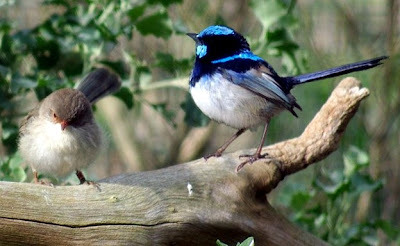 I use to have a little blue Wren visit my bedroom window so I couldn't pass up this guy a few years ago. And now he's looking out over Amsterdam canals. Must be chilly.